The next time you go to see your eye doctor be sure to ask him this question, "Do you see any macular drusen?" He may be surprised by your knowledge, but more importantly you will find out more about the health of your retina. For those of you, like my husband, who have a family member with macular degeneration, you want to pay close attention to what your eye doctor sees during your yearly eye exam, especially as it pertains to your retina. What are Macular Drusen and How Do They Affect Your Vision? 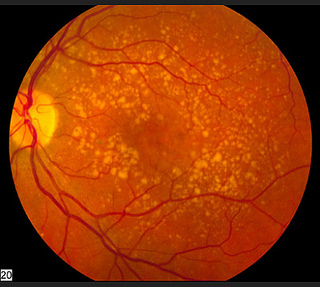 Macular drusen are small, round deposits of calcium and waste products. They appear as light yellow spots during a clinical exam of the retina. Drusen can be considered harmless or harmful depending on the size, shape and texture of them. The presence of drusen can be one of the first clinical signs of age related macular degeneration (AMD). AMD is the loss of central or straight ahead vision that helps us read, drive and recognize faces. Can Drusen Affect AMD Progression? The detection of macular drusen can help identify those who are at risk for developing AMD. "Drusen within the macula are a significant risk factor for the development of AMD." For those who have already been diagnosed with dry macular degeneration, the size, number and type of drusen can be a prognostic factor for the progression of dry macular degeneration to wet macular degeneration. "Large numbers of drusen or large confluent drusen are also associated with a significantly increased risk of developing choroidal neovascularization, characteristic of the exudative (wet) form of AMD."